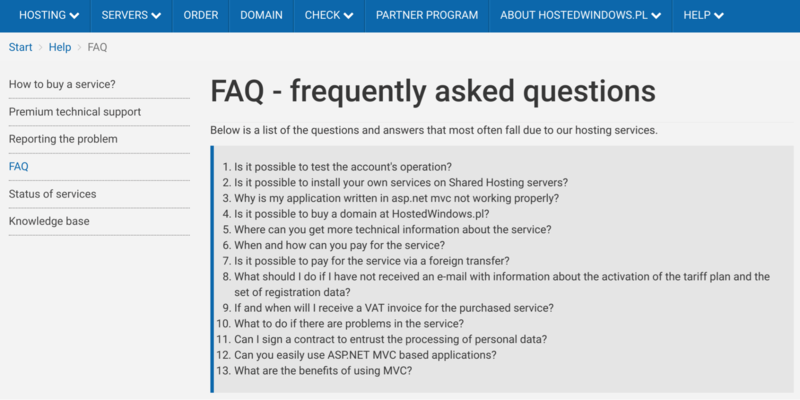 HostedWindows.pl Review 2019: Is HostedWindows.pl a Good Hosting? Warsaw-based HostedWindows.pl was the first Polish company to offer an enterprise Windows hosting platform for ASP.NET apps and Microsoft products. This vendor also provides specialized shared hosting, WordPress hosting, VPS, dedicated solutions, and domain registration services. Founded in 2006, HostedWindows.pl is a trusted name in the Polish web hosting space. It offers premium ASP.NET hosting, WordPress hosting, dedicated servers, VPS, and domain registration services. Some of its customers include media houses, insurers, and telecommunications companies. As a leading Windows hosting service in Poland, HostedWindows.pl owns and operates a private cloud infrastructure that meets the demands of local businesses and local regulations. The benefit of this is that users get ample storage and dedicated resources for all their mission-critical websites and apps. The server facility is staffed 24 hours a day by experienced network engineers. HostedWindows.pl provides a suitable hosting environment for enterprise-grade ASP/PHP applications and WordPress sites. You can build a dynamic ASP or PHP app, import an existing website, and even deploy a WordPress website quickly, then secure it with the free Let’s Encrypt SSL from within the MSPControl panel. You can also manage your databases, security settings, emails and much more from a central place. With HostedWindows.pl, you don’t need to worry about data loss because you can benefit from automatic and managed backups of websites, emails, and databases. It’s easy to rollback a website to an earlier instance and even to restore key files that had been deleted accidentally. HostedWindows.pl’s packages are not cheap by today’s standards. Though costly, this provider’s prices do match its high-quality services and robust features. Customers can try out any hosting plan for seven days. You can order dedicated IP addresses, additional disk storage, and Microsoft SQL 2012 databases for additional fees. Customers can seek technical assistance 27/7 by email, telephone, or online form. Polish-speaking staff will help you resolve any problems related to either implementation or the applications they provide, but nothing beyond that. As a first step towards getting support, you might check out this company’s online knowledge base and FAQs. HostedWindows.pl offers solid hosting for ASP.NET apps and WordPress websites along with premium technical support and data protection in compliance with GDPR regulations. Wondering how HostedWindows.pl stacks up against other Web Hosting companies? Enter any other Web Hosting company and we will give you a side-by-side comparison.